I've previously discussed TV events like the X-Factor, Eurovision and the Obama Inauguration in highlighting the trend for social TV, but these have been based around people discussing programme content rather than the ads around that content. In certain cases TV ads have successfully become branded content that people want to watch again online and share with their friends (the Cadbury Eyebrows as an example), however the unique production budgets (and consumer anticipation) around the Superbowl ads means that we can judge ads side by side and use social interest as part of the effectiveness measures around these spots. With 30-second ads selling for between $2.5m and $2.8m around Superbowl 2010, having ads live on through the internet is not just desirable but vital for the ROI equation too. The quest for further engagement online has prompted some advertisers, like GoDaddy, to (successfully) use creative to drive viewers directly to their sites to see further footage - or in GoDaddy's case the content that was 'Too Hot For TV'. However, no advertiser took the plunge on pushing a social Destination like a Facebook page or Twitter account via a Superbowl creative and bloggers like Jon Burg think this was a missed opportunity - especially as whether they like it or not, ads are living on and being discussed in social spaces. 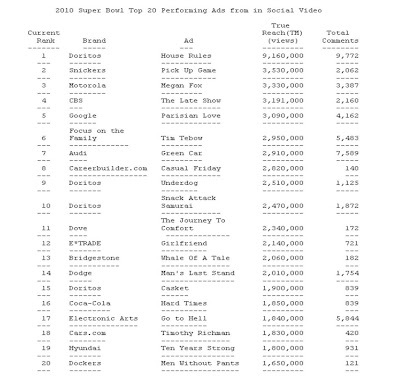 - In total the 2010 Super Bowl ads have been viewed 90 million times in social video. The ads have spanned nearly 3,000 total unique video placements across more than 30 video-sharing networks and have generated more than 60,000 comments and 90,000 ratings. - Doritos, who ran four user-produced ads during the 2010 SuperBowl broadcast, had the #1, #9, #10, and #15 most-viewed ads in social video. Taken together, these ads have been viewed over 16 million times – or 18% of all social video views in the study. - Two of the more controversial campaigns attracted high numbers of comments with Audi's Green Police ad in second and the Focus on the Family spot fourth. The Visible Measures figures are another example of how TV exposure drives consumers online. Clearly some of the TV ads were part of strategies that had heavy online components (the Dorito's UGC competition, the Budweiser Facebook 'choose the ad' vote etc), but it is interesting to see the extent to which ad views and ad commenting have occurred after the event - and worth noting that this has happened regardless of advertiser involvement.